I first met Hilary and Graeme in March or April 2012 when they hired a boat at Calcutt with the intention of buying their own boat before they handed the hire boat back and then cruise for the rest of the spring and summer. It was quite an ambitious undertaking, but they managed it. Here’s their story. and medieval). We both play and sing, and used to do quite a lot of private gigs. My website is here and you can visit it for more information. I was always interested in changing landscapes. I was born in England, but my parents took me to the then Union of South Africa when I was three and some months. I was always fascinated by maps and my surroundings, and when our plane took off (BOAC Constellation, a classic), the first thing I said was: “Mummy, look, maps!” I lived in Johannesburg, South Africa for many years, but like my mother, always wanted to go back to England. Eventually, when I returned for to England for the second time, after having lived in Cambridge for a short six months, I lived and worked in London in 1973. During that time, I worked in Cricklewood, not far from the Paddington Arm of the Grand Union Canal. I was so fascinated by the canal, I used to take my bicycle down to the towpath every good weather day, and cycle past the gasometer and Kensal Green Cemetery. I always wondered how far the canals went, and whether one could keep on walking/cycling on the towpath forever! One day I walked and cycled where possible, all the way down to Little Venice. I saw some live aboard boats there at the time, but there were very few, and I certainly never saw any travelling along the then derelict canals! Later on, when I emigrated to Australia (in the days when a British Citizen could just walk in with a TB clearance), in 1974, I fell in love with the weather, and Sydney harbour as I am a water person, having travelled by boat, and that is how I arrived in Australia after an overland journey from London to Singapore. I used to take a little ferry across the harbour for many years when I worked in the city. Still, I longed to go back to England, but I had settled in Australia, and went to technical college and university there. Melbourne University Publishing published my pictorial book, Virtual Voyages into Virtual landscapes which included multimedia a DVD production, https://estore.mup.com.au/items/9780522852035. I created sixteen virtual environments representing places I had visited, or remembered seeing in film. Such was my fascination with travel and being in different geographical locations. This was an outcome of my thesis about my work and the creation of virtual landscapes using fractals. Meanwhile, I was teaching and lecturing after my years of work in drawing offices and illustration studios. 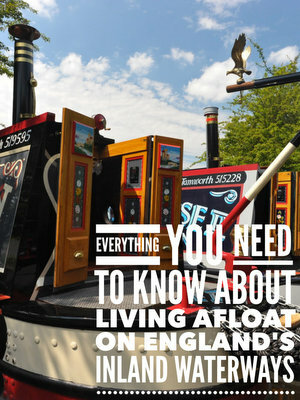 I was getting near to retirement, and we went overseas twice, and the first time early 2007, we had spent ten days on the South Oxford canal from Lower Heyford on a tiny Oxfordshire Narrowboat named Radcot. 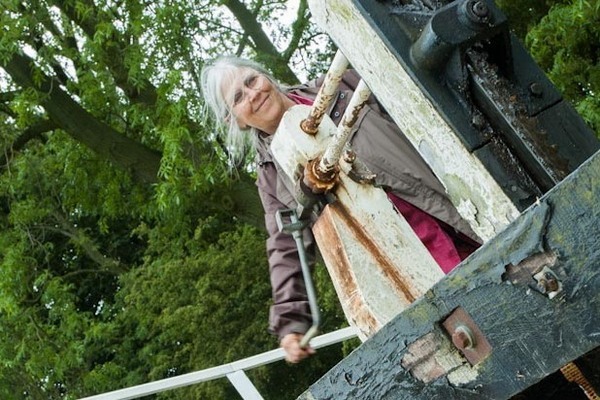 We had such a lovely adventure that we decided to travel on the inland waterways on the next trip which was in 2010, and we decided to hire a boat to travel the Llangollen canal and cross the mighty Pontcysyllte Aqueduct and travel along the Shroppie. We loved it so much, we were very sad to leave. This is when we began toying with the idea of buying our very own narrowboat, so that we could travel anywhere on the system and as long as we wished, without having to turn back. I retired this year, and had enough saved up to buy a second hand boat of reasonable quality. The idea would be to keep our house in Australia, and live on the boat during the Australian winter and enjoy the UK spring and summer months. We arrived in Calcutt in March, and in two weeks, we fell in love with a boat Paul and Russ introduced us to: NB Willow. A twenty year old Colecraft boat, fitted out by Calcutt. I had been looking at several boats on the internet, but there were very few that we were interested in. NB Willow was the fourth boat we actually went into and we liked what we saw. NB Willow was named 20 years ago and the name was so nice, we decided to keep it. It suited the boat and we felt she would be upset if we changed it. The name we were thinking of, say, if she had been given a dreadful name like Cirrhosis of the River or something like that, was Willie Byrd, named after a very musical Australian flycatcher called Willy Wagtail. The Byrd spelling is also refers to William Byrd the Renaissance composer who is one of our favourites, and I would have painted the name myself, and illustrated it, but no, NB Willow it stays, and it will always be during the time we own her. While we are in Australia, our boat is on hardstanding at Debdale Wharf Marina, where it is being looked after by Nicky, Mike and the other wonderful staff who will protect her while we are in Sydney. Paid straight out of our savings. I had to keep my eye on the exchange rate for months, and transferred the money from Australia straight to Calcutt. Retired, who knows if I do any part time work later, sign painting for boats or canal art maybe, or even a music gig perhaps. The UK weather when it gets rotten (we are spoiled from living in Australia, New Zealand and South Africa too long). Freedom, the feeling of fellowship on the canals, new and different places to visit, canalside pubs, the history, mapping, the excitement and challenge of locking. The adventure of it all. Fix it all up so it is perfect for our needs, we are doing that to the best of our ability and with a deal of outside help (Graeme does most of the carpentry on the boat), we have had to change a lot of the storage which a problem as we had three large suitcases and a few musical instruments. We need a new gas stove as well as a fridge that will keep its temperature (we have gas one at the moment). Walking to Tescos, Sainsburys and the Co-op. Also, local shops. Great way to visit villages and towns. We very rarely take busses. If the weather is too rotten, we take a taxi back to near the boat mooring. I lost about 10lb during these six months, despite indulging in Tesco Trifles, Syllabub, and all the yummy things along the way in the pubs, coffee shops and restaurants. In the bath. After a bath which we have after a long run of the engine during a cruise, there is lots of hot water and we wash the clothes in the water. Good way to recycle. It is then drained over the bath and then hung out to dry in the cratch. If the weather is bad, it dries in the cratch and later near the fire. A pump-out (pump and dump). Uncomplicated and we found we only had to pump out every six weeks! How? 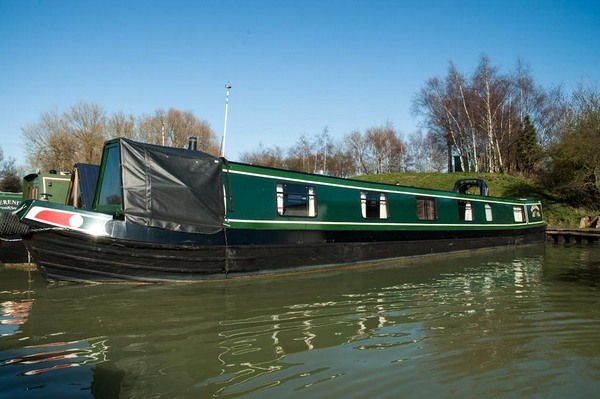 By mooring near conveniences, using them while visiting supermarkets and pubs. I used T Mobile for my iPad when out and about, so I could get directions and find my way. I never got lost! I was very happy with my 3 com service, and got 10GB a month with their dongle on my Macbook Pro. I dangled the dongle on the window near the front of the boat, and most of the time the reception was very good. Only place that had a dodgy connection was at Crick (must have been the tunnel ghost). This is difficult, but we loved Foxton Locks for the excitement and the view. The Pontcysyllte Aqueduct on the Llangollen is also unforgettable. Birmingham navigations (BCN) is real adventure. I love all the industrial architecture and the excitement of Brummagem. The Perkins D3 Engine alternator. Not much electricity is used, and we can survive without starting the motor or without being connected to an external generator or power supply for four to five days. Our lights are now all LEDs and the computer as well as many other electrical appliances are powered on the 12V system. We have one starter motor battery and two domestics. We have not been on NB Willow in winter, but certainly during the early months we could keep warm with the Morsø Squirrel solid fuel stove. Plenty of wood around floating in the canal and sitting on the towpath for free, and the smokeless ovals last a very long time. It is a wonderful adventure, but it is worth reading up a lot about it before you decide to buy your own boat. Certainly hire one first. It is a cross between buying a house and car. Really, like a caravan. Watch out for serious stuff like rust, and try to test all things before committing yourself. Buy from a reputable dealer, broker or marina, a place that cares about boats.